On successful completion of this entry level course you will be awarded BSAC Ocean Diver certification. This is recognised world-wide, and qualifies you to dive to a maximum depth of 20 metres. Although we can take students as young as 14 for scuba training they do need to be accompanied by a participating parent or guardian. 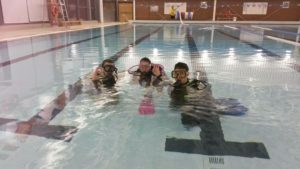 The course starts with lectures from 7.30pm until 8.30pm on Tuesday at The Blackpool Light Craft Club followed by practical sessions in the Palatine swimming pool from 8.30pm until 9.30pm on Wednesday. For your training in the Palatine swimming pool, you will only need to purchase the basic kit (a dive mask and snorkel) to supplement the hired scuba kit.There are a wide choice of masks and snorkels available, so we advise you not to buy anything until after the first introductory lesson where advice will be offered about the different types and how you can test your mask to ensure you have the correct fitting. Wetsuits may be worn for pool sessions if you own them, but swimming costume and a T Shirt will be sufficient. Following successful completion of theory lessons and pool work you will progress to open water lessons starting in Eccleston Delph. The water is much colder than the swimming pool and is essential that you hire or buy a drysuit. Most trainees opt to complete open water training in a drysuit which can be hired from local dive shops. Hood, gloves and sea fins will need to be purchased at this stage. Guidance will be provided during training. Your final qualifying dives usually take place on a weekend day boat or in a quarry. 7 x Theory lessons Tuesday evenings from 7.30pm – 8.30pm in our lecture room at the Blackpool Light Craft Club. 5 x Pool lessons follow from 8.30pm – 9.30pm in the Palatine Pool on Wednesdays. 5 x Open water lessons take place following successful completion of a written theory test and successful completion of pool sessions. These begin in inland lakes of progressing depth – Eccleston delph or Capernwray. Final sea familiarisation dive(s) are arranged at the coast. Tuition of Ocean Diver training courses run within the club are free to members but you will need to pay a small fee to BSAC for training materials. Club kit is available to hire but you will need to purchase your own mask and snorkel. Pool fins are included in the hire kit but eventually you will need to purchase sea fins for your Open Water dives. You can buy or hire Dry suits from local Dive shops. There are additional costs connected with the open water dives: entrance fees to training lakes (typically £9.00 – £15.00 per day). You will also need to arrange and pay for your own travel and accommodation for weekend dives at the coast, which may involve Friday and Saturday night accommodation depending on tides and ‘ropes-off’ times.